It is common knowledge that genealogy is one of America's fasting growing hobbies. It is perhaps easy to understand that in our present society where the family is often under siege, it has become important to strengthen our sense of fami ly by seeking out our roots. Historical societies, libraries, government archives and a rapidly growing number of internet resources are receiving an ever increasing number of inquiries for information about one's ancestors. Gilford's Thompson-Ames Historical Society is no exception. From time to time the historical society has done a little research of its own in an attempt to find information in response to the inquiry of someone calling from some place such as Oregon or Michigan seeking information about "our great grandfather. We believe he was born in Gilford, New Hampshire. Can you help us?" We begin b y checking our own resources - cemetery records, deeds, town reports, town histories, etc. - to see if the name appears in any of our collections or books, and we may also make a few phone calls to check other possible sites. Any information gathered in this way becomes a part of our on-site genealogical files. Occasionally we receive unsolicited copies of a family history from someone who wants to share the record of their Gilford ancestor with other researches. We welcome such donations. T-AHS also has an interest in finding information about those who were among the first settlers of our town. Among the earliest, a list of 19 names is submitted by Hector Buldoc in his booklet "The Gilford Story", published in 1962 by Thompson-Ames Historical Society. This short list is followed by the list of petitioners, 147 in number, who in 1811 asked that a new town be incorporated for those settlers of the "Upper Parish" of Gilmanton who experienced grave inconvenience and expense having to travel up to twenty, often difficult, miles to conduct business and attend town meetings. We know little about these families. Although many names are still common in Gilford and the Lakes Region, others seem to have disappeared altogether. We are grateful to summer resident, Clifford Leslie , who several years ago, together with Gilford resident Don Frost inventoried the McCoy cemetery – perhaps the earliest public cemetery in town. Leslie has for the past few years been delving into the genealogy of a few of these early settlers with interesting results. 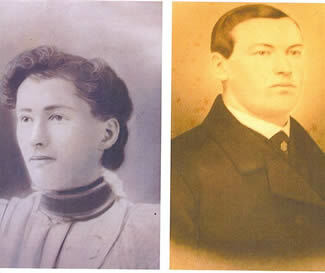 For a list of these early settlers, please check our web site. So far, he has added to our knowledge of such families as Sleeper, Thing, Carr, Goss, Elkins, Bartlett, and Saltmarsh. Reading about these individuals gives us a sense of connection, not just to an individual family but to the collective roots of our town. In the case of Mr. Saltmarsh, while we might theorize that an early ancestor took his name from a salt marsh near which he lived, in Gilford, Saltmarsh Pond Road does not refer to a road near a salty marsh, but to a man of that name who settled in that area and gave his name to a nearby pond and to the road which passed his house and which he most likely constructed. We also discover that Carr ran an inn on the road to Portsmouth, where travelers stopped to have a drink of ale on the long and dusty road, or to break their trip by an overnight stay. You may know Carr's Inn under its most recent name as The Christmas Tree Inn Restaurant on Route 11. In addition to the names mentioned above, T-AHS has some miscellaneous genealogy information of the following families: Ames, Collins, Dame, Davis, Follett, Gilman, Guild, Mason, Hunt, Jewett, Potter, Roberts, Rowe, Sawyer, Smith, Swain, Tilton, Watson and Weeks. If you are interested in any of these names, please contact us for more information. Many other names appear on deeds, letters, cemetery lists, etc.. Gilford's historical society also has a number of unidentified portraits and photos, perhaps members of these very families. Among these, there are four large, unframed portraits that seem to belong together and may be members of one family. The only one identified is Mercy Watson, the younger woman. 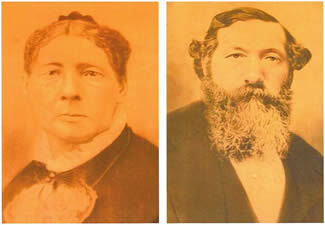 It is easy to speculate that the older man and woman are her parents, Job and Elizabeth Watson. And perhaps the younger man is her brother, Reverend John Watson. We do not know. Perhaps a reader may be able to help us identify the other members of this group. If you have photographs or genealogical information of your Gilford ancestors, please consider sharing this information with us. Photographs can be copied and the original returned to the donor. Gilford's Thompson-Ames Historical Society can be reached at 603-527-9009, thomames@worldpath.net, or by writing to us at P.O. Box 7004, Gilford, NH 03249. You may view our website at www.gilfordhistoricalsociety.org .